SCP Auctions, one of the nation’s largest auctioneers and private sellers of important sports memorabilia and cards, has just unveiled its new website: scpauctions.com. Full of vibrant colors, fresh design and user-friendly navigation, the new look is highlighted by the company’s world-record prices for top lots over the past two decades as well as easy bidder registration for upcoming auctions and search capabilities for recent online auction results and highlights. As the company that has set world-record prices in several categories including a Babe Ruth circa 1920 game-worn New York Yankees road jersey for $4.4 million, a 1909-11 T206 Honus Wagner baseball card for $2.8 million and one of Jesse Owens’ 1936 Olympic gold medals from Berlin, Germany for $1.4 million, SCP Auctions has reconstructed its online look and feel to engage users to peruse the site and fully understand the company’s far-reaching capabilities. A newly added z-mag of the company’s latest catalog is now available online as is a brand new Blog that showcases the company’s achievements and record sales as well as important new consignments and company events. An impressive testimonials section from professional players who have consigned their personal collections to SCP Auctions like Julius Erving, Bob Cousy and Paul Hornung is also featured. SCP Auctions’ 2015 Spring Premier is scheduled to start on March 25 with its consignments deadline fast approaching on February 13. The auction will be conducted online at scpauctions.com. For more information, call 949-831-3700. He will forever be “Mr. Cub,” the most popular player ever to roam the friendly confines of Chicago’s Wrigley Field. His sunny personality is legend, as is his refrain on a sunny day: “Let’s play two!” The first black player on the Cubs, Banks came up as a shortstop, where he won consecutive MVP awards (1958-59), but actually played more games at first base. Always a fan favorite with the Chicago Cubs during his playing days from 1953 to ’71, Banks even joined the Cubs coaching staff following his retirement. He still holds team records for games played (2,528), at-bats (9,421), extra-base hits (1,009) and total bases (4,706). And now one of his rarest Cubs jerseys is on the auction block at SCP Auctions. The current high bid with 11 days remaining is $44,291.00. As most advanced flannel collectors know, Banks is considered the third rarest 500 HR Club member jersey behind Mel Ott and Jimmie Foxx in completely original, unaltered condition. Remarkably, it is widely believed that more Babe Ruth jerseys exist than those of Banks. One theory as to their extreme scarcity is that several of the handful of known original Banks jerseys were tragically dismantled by various trading card companies for use on “swatch” cards in recent decades. Among the few surviving original, unaltered Banks jerseys known, the 1969 Cubs home example ranks near the top. Largely unknown to the collecting community it has rested quietly for more than 20 years as the centerpiece to the late Bill Riddell’s esteemed collection in southern California. “With regard to quality, condition, rarity and provenance, we unabashedly rank this among the finest game worn flannels our firm has ever handled,” said Dan Imler, vice president at SCP Auctions. Stunningly beautiful, the jersey’s impeccable technical details include a Wilson size 40 tag sewn on the front tail along with a black chain stitched “1969”. Inside the collar is a strip tag reading “14-69-1-40″ in chain stitch indicating the jersey number, year of issue, set number and size. The embroidered circular Cubs logo is sewn onto the chest while Banks number “14” is sewn on the reverse in blue tackle twill. A Cubbie Bear patch appears on the left sleeve and its original MLB 100th Anniversary patch remains on the right sleeve. Banks has signed the front of the jersey in large black marker. It is worth noting that among the other known Banks jerseys is a similar 1969 home Set 2 (this is the Set 1). In spite of the Set 2 example having a replaced MLB Anniversary patch it sold at auction in 2012 for $169,000. Online bidding is open to registered bidders and concludes Saturday, Dec. 6. The auction is being conducted online at SCP Auctions. For more information, call 949-831-3700. 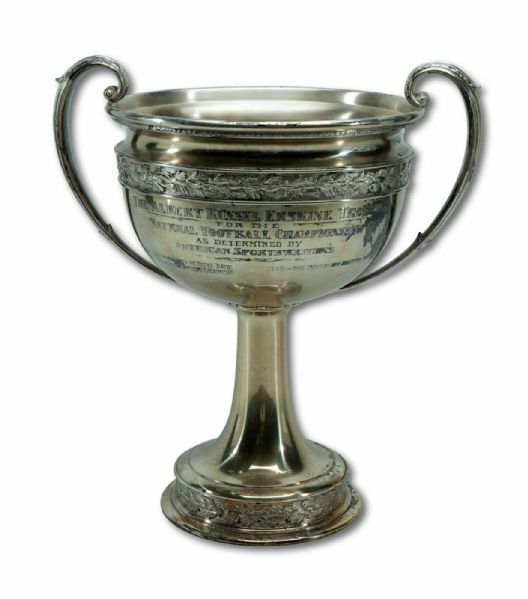 Nearing the 86th meeting this Saturday between college football powerhouses USC and Notre Dame, a very prestigious award – the 1929-31 College Football National Championship Trophy ‘The Albert Russel Erskine Trophy’ – is on the auction block at www.scpauctions.com. Its current high bid with 10 days remaining in the online auction is $6,655.00. Estimates put the winning bid near $30,000. In the 1920s, Erskine, an American businessman and Studebaker Corporation President, served on the Board of Trustees of the University of Notre Dame, where his son Albert, Jr. studied. He took a strong interest in college football and initiated in 1929 the Albert Russel Erskine Award for the best team of the year. The winner was chosen by a panel of American sportswriters whose methods are still used to select the college football national champion. The award bears special engravings on the front recognizing the national championship teams from 1929 to ’31: Notre Dame (1929 and ‘30) and USC (1931). The grandiose, silver-plated trophy, which stands 21” tall, 21” wide and weighs 16-and-a-half pounds, is an impressive piece of artistic craftsmanship. The oversized goblet, plated by Reed & Barton, boasts rings of raised olive leaves around its base as well as around the top of the trophy’s cup. A pair of very ornate handles can be found on either side. Engraved across the front is the following passage: “THE ALBERT RUSSEL ERSKINE TROPHY FOR THE NATIONAL FOOTBALL CHAMPIONSHIP AS DETERMINED BY AMERICAN SPORTSWRITERS.” Accompanying the trophy is a special “ALBERT RUSSEL ERSKINE AWARD” scroll/certificate that was awarded to USC Head Coach Howard Jones for winning the 1931 National Championship. Committee members of the board that presented the award read like a regular “Who’s Who” of important Americans at the time including Avery Brundage, Robert T. “Bobby” Jones, Jr., Douglas MacArthur, Connie Mack, Theodore Roosevelt and Wm. Wrigley Jr. The accompanying image captured in 1932 shows legendary USC coach Howard Jones standing next to his car with both this trophy and his young daughter displayed proudly on its hood. Online bidding is open to registered bidders and concludes Saturday, Dec. 6. The auction is being conducted online at www.scpauctions.com. For more information, call 949-831-3700. Babe Ruth’s first season with the Yankees, 1920, is still reverberating. He batted .376, hit 54 home runs and drove in 137 runs. Attendance at the Polo Grounds more than doubled to 1.29 million. It was the season when the future Yankees dynasty began to take shape. Ruth wore a gray wool road jersey that season to perform in Boston, St. Louis, Chicago, Cleveland and the three other American League cities. “Ruth, G. H.” is still visible on the collar in faded pink script. Blue letters spell “New York” across the chest. Dirt stains — and probably some from sweat — are evident. And now, it is the most expensive sports artifact ever sold at auction.